A Letcher father and son were indicted earlier this month by a federal grand jury for multiple counts of tax evasion. Theodore “Ted” Nelson, Jr., 66, and his son, Steven “Steve” Nelson, 43, are facing charges of conspiracy to defraud the United States, impeding the Internal Revenue Service and a combined seven charges of failure to file income tax returns. The Nelsons appeared before U.S. Magistrate Judge John E. Simko on July 10 and pled not guilty to all charges. A motions hearing is scheduled for the morning of Aug. 6 in Sioux Falls and jury trial is set to begin Sept. 10 at 9 a.m. U.S. District Judge Lawrence L. Piersol will preside. If found guilty, the Nelsons each face a maximum of five years in prison and/or a $250,000 fine, plus restitution for the conspiracy charge. The failure to file taxes charges each carry a maximum of one year in prison and/or a $10,000 fine, plus restitution. The impeding charge carries a maximum of three years in prison and/or a $5,000 fine. The indictment states that the conspiracy to defraud the United States in order to avoid paying income taxes began prior to April 1, 2002. Together, Ted and Steve formed 39 trusts, corporations, LLCs and other entities using income from their Sanborn County farm to fund them. Ted and Steve inherited the farm, located in southern Sanborn County near Letcher. The pair allegedly conspired to evade paying their tax liabilities to the IRS by forming a number of fake trusts, opening bank accounts in the names of those trusts and other names and hiding their income and assets. According to the indictment, the Nelsons used John Sheridan as the trustee on numerous trusts, and also as a signor on most of their bank accounts, until his death in February of 2011. Ted, Steve and Sheridan were all involved with the Pembina Nation Little Shell Band of North America, an unrecognized spin off of federally recognized Chippewa tribes in North Dakota and Montana. Members of this group are generally whites who claim they belong to a sovereign Native American tribe, and therefore are not subject to United States laws and regulations. The IRS placed liens against their property in February of 2004, after which, documents state they conspired to transfer assets and bank accounts out of Ted’s name in order to hide assets from the IRS. According to the indictment, on April 20, 2004, Ted and Steve opened five different bank accounts in the names of bogus trusts, using false Taxpayer Identification Numbers. Around this time, Ted also became a member of a sovereign citizens group called the “republic of South Dakota”. After being notified by the IRS in 2007 that he was under investigation, Steve claimed sovereignty, filing a document titled “Declaration of Independence by Political Choice” in Sanborn County in May of 2008. In July of 2010, during an interview with an Assistant United States Attorney, Steve and Sheridan presented a document explaining their position on IRS matters. Documents state that Steve said he did not think federal income tax laws are legitimate. In January of 2011, Steve testified at his divorce proceedings that he submitted a 2,000-page document as his tax return. He said the reason for the document was to ask the IRS why he has to file tax returns. Ted served a year in prison beginning late in 2011 for harboring a man who was wanted for tax fraud and other federal crimes. Both men were released on their own recognizance and were represented by court appointed attorneys at their initial appearance. The indictment gives no indication as to how much money the Nelsons owe the IRS. The investigation is being conducted by the Internal Revenue Service. Assistant U.S. Attorney John E. Haak is prosecuting the case. The Sanborn Central/Woonsocket Blackhawks Volleyball team is putting in a little extra work this summer at a week-long volleyball camp this week in Woonsocket. The camp began on Monday and runs all day, every day this week. Camp coaches are Nir Ofer and Troy Tye of California. Volleyball practice begins Aug. 19 in Woonsocket. 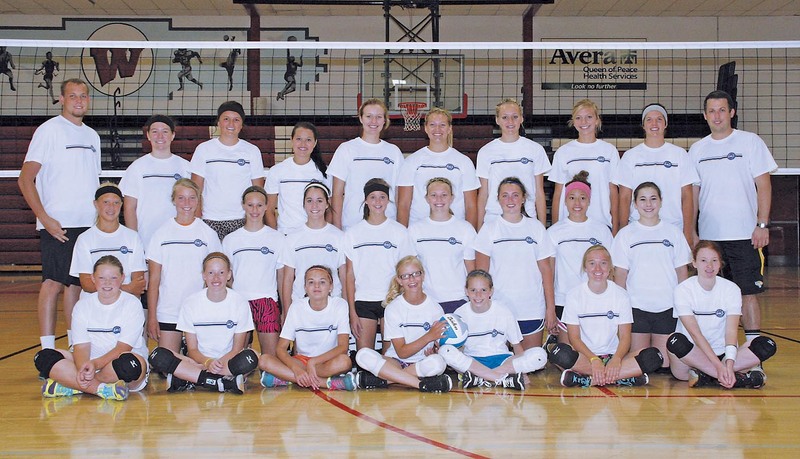 Those taking part in the camp are shown above, in back, left to right: Troy Tye, Renee Farmer, Abby Doering, McKenzy Peterson, Morgan Selland, Tayla Weber, Cheyene Kauffman, Ashley Schmit, Savannah Swenson, Nir Ofer; middle row: Tessa Jensen, Bailey Moody, Alissa Ball, Callie Bezpaletz, Tristen Ziebart, Sarah Morgan, Jessica Schmit, Kyla Morgan, Breanne Brandenburg; front row: Erica Howard, Maddie Vermeulen, Megan Kleppin, Madi Moody, Abby Vermeulen, Kayla Olson and Michelle Carda. The annual Sanborn County Achievement Days will begin Wednesday, July 31 with static exhibit and Open Class judging. A highlight of the evening will be the bake sale from 5:30-7 p.m. where the public is invited to purchase quality 4-H baking. The lunch room will also be open to accommodate supper needs for everyone. New this year will be the poultry and rabbit judging on Friday evening, Aug. 2, at 5 p.m. Display exhibits will be available for viewing and the concession stand will be open. Please come and support our 4-Hers in the poultry and rabbit areas. On Saturday, Aug. 3, things kick off with a community pancake breakfast, sponsored and served by these local businesses: First National Bank South Dakota, Hegg Insurance, South Dakota Wheat Growers, Sanborn County Commissioners, Dakotaland Federal Credit Union and CorTrust Bank. Pancakes will be served from 7-9 a.m.
At 9 a.m., things get rolling with a Farmer’s Market, dog show and livestock show. A complete listing of events with times can be found in the Achievement Day ad elsewhere in this paper. Entries for the annual pie contest will be due by 3 p.m. Saturday afternoon. The Sanborn County Health Fair will run from 3-5 p.m. followed by the community barbecue. L & M Foods will be providing the beef for sandwiches and Avera Health Plans will be assisting with the barbecue this year. Tickets are available from 4-H families and at the Extension office at (605) 796-4380. This year the leaders will also be hosting a free-will pie social with all the proceeds from the social going to Keith Senska for medical expenses. The evening will end with a program consisting of Fashion Revue, Parade of Purples and pie contest winners and auction. Livestock and indoor exhibits will be released following the program. Bring your entire family and plan to spend the whole day. Sanborn County’s 4-H program is working hard to “Make the Best Better” in Sanborn County.